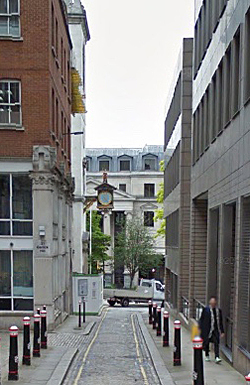 The name of this City of London street – which leads from Upper Thames Street to the intersection of Queen Victoria and Cannon Streets – speaks to the City’s past when it originated at the now-lost dock or jetty known as Garlickhithe. Garlickhithe was, not surprisingly, where garlic was landed and sold in a tradition dating back to at least the 13th century. It’s one of numerous thoroughfares in the City named for what was traded there. The name is also remembered in the church which still stands at the bottom of the hill, St James, Garlickhythe, and which once stood right on the back of the Thames. The church was founded in the 12th century, rebuilt several times – the last time after the Great Fire of London under the direction of Sir Christopher Wren.